HomeCinemaMasalaJohn Abraham’s Force-2 hit by the turmoil. John Abraham’s Force-2 hit by the turmoil. 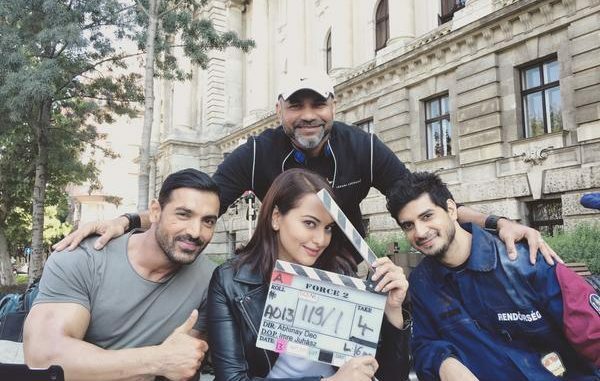 John Abraham and Sonakshi Sinha’s shoot for ‘Force-2’ had to be pushed ahead due to repercussions of the Syrian War refugee crisis. John Abraham and Sonakshi Sinha are in Budapest, Hungary, to shoot for Abhinay Deo’s Force 2 — the ongoing schedule will wind up by October 22. However, pulling off a shoot there has been no mean task, thanks to the Middle East turmoil that has affected the country too. “ The current environment of Budapest where the unit of the film is based has generated a political discussion with the Syrian War refugees attempting to enter the region through Hungary and Germany. The mahurat shoot was slated for September 6, but producer Vipul Shah asked the team to put it off until September 12.” says a source. The ‘Force-2’ team had, however, fixed the location well in advance and did not want to change the venue. The Source further adds “ Many Hollywood films have been shot in Budapest and the makers of this film had also zeroed in on an interesting place in the city to kick off the first schedule,” . Force 2 is Directed by Abhinay Deo and Produced by Vipul Shah. Will content emerge to be the King on 2nd October this year? Team Talvar to hold a special screening for Shahid and Shraddha. Living near the Ocean or Inland? Which Is Healthier ? Did L’wren Scott Have Something To Hide?